The Internet of things begins here: with the flick of a switch. The smart home is currently a rat's nest of specs. However, growing pains are a natural part of the development of any new market as alliances are still being formed and standards are still being written. We don't need to look further than the young market for "smart" light bulbs — bulbs connected to the home network and controllable through apps or Web pages — to understand the confusing array of connectivity specs used in something so mundane. It's easy to find examples of smart bulbs that are based on five incompatible connectivity technologies, and there are more out there. Some are based on open standards, some tightly controlled by one or a few companies, some require specialized hubs and some can be controlled directly by smartphones. Bulbs are inexpensive and easy to install, so this is where the market for smart things will begin for most households. If you can screw in a light bulb, you can create a smart home. It's a first step. It's now likely that ZigBee will be the first Internet of things connectivity standard for many of these homes. General Electric is pushing smart bulbs to the masses with the introduction of its ZigBee-enabled Link smart bulb. 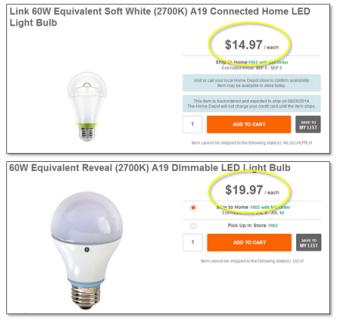 At $15, we expect GE's Link to be a big hit among US consumers who will see smart bulbs next to their similarly priced "dumb" siblings on store shelves (see below). This could quickly drive ZigBee volumes to mass scale, leading to further price reductions. GE's smart bulb is not the first ZigBee bulb on the market — Philips' high-end and impressive Hue smart bulb is also based on ZigBee. However, it is the first to reach such a comfortable price for consumers. ZigBee devices do require a single hub (a $20 product, in GE's case), but the cost is diluted across devices and over time thanks to the long life of LED bulbs. The smart bulb market is particularly interesting given the current global shift away from incandescent light bulbs toward long-lasting, power-efficient LED products. There are billions of light sockets in the world soon to be filled with something different. It's a brilliant opportunity to establish standards in the home.